President Trump’s new executive order on immigration, issued today, closely resembles the January executive order that preceded it. A federal judge in Washington state halted the first order on constitutional grounds, a decision upheld by a 9th Circuit Court of Appeals decision last month. The first executive order, according to some political observers, was straight out of a dystopian novel. Titled “Protecting the Nation from Foreign Terrorist Entry into the United States,” the order immediately suspended all travel to the U.S. from Syria and six other Muslim-majority countries. The move appeared hastily executed and lacked a coherent rationale from the perspective of national security. Why those seven countries, critics wanted to know, and not other Muslim-majority countries? Why bar entry to green-card holders, who had already been intensely vetted? Why provide no warning, stranding thousands of legal immigrants and long-time permanent residents abroad? Today’s order has the same title and the same purpose. Iraq has negotiated an exit from the list, and the second order, unlike the first, does not specify an indefinite ban on Syrian immigrants. The new order goes into effect in ten days. In official statements regarding the first order, the White House insisted that the ban was not a ban, and especially that it was not a Muslim ban—though the text of the January order named only Muslim-majority nations and allowed for exceptions “when the person is a religious minority in his country of nationality.” These and similar bald self-contradictions elicited comparisons to George Orwell’s Nineteen Eighty-Four and other works of fiction that imagine the coercive power of a fully totalitarian state. Nineteen Eighty-Four currently sits at #22 on Amazon’s bestseller list. Margaret Atwood’s Handmaid’s Tale is #37; a television series is forthcoming on Hulu. 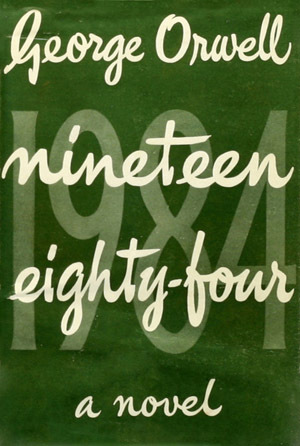 Nineteen Eighty-Four had topped the list following the January order. People are hungry for answers and precedents. Note that the first executive order named no countries “in which Islam is a minority religion”! Notice, too, how important it is for those who crafted both orders to dispute the (blatantly) hateful motivation of the first order after the fact. Section 1.b.iv exemplifies this administration’s agonistic relationship with the truth. Expect Nineteen Eighty-Four to see another spike in sales. Reference to dystopian novels is appropriate not so much because Nineteen Eighty-Four predicts Trumpism as because Trump behaves like a caricature, bypassing the details of policy in pursuit of ratings. The immigration executive orders, like other actions taken by Trump in the first months of his presidency, seem motivated by a desire to rile up his base rather than by any informed political program. The settings in which his actions make sense, and to which they are directed, remain the Twitterverse and the well-attended rallies of the faithful. The idea that the immigration bans make American citizens safer could be charitably described as a fantasy. No national of any of the six (or seven) countries has killed anyone in a terrorist attack in the United States in the past 15 years. Most years, more Americans die at the hands of toddlers with guns than perish by terrorist violence. This includes domestic terrorism, which neither version of “Protecting the Nation” addresses. As often in politics (and fiction), ideology masquerades as policy. The executive orders amount to an emotional indulgence for xenophobic factions on the right. Therein lies their fictional essence. Of course, that is no consolation for those affected by the bans nor their families in the United States and abroad. Fiction is not an escape from reality but a way of experiencing it. Emotional indulgences always seem to come at the price of someone else’s pain. For the time being, Americans (and the world) may be locked in a Nineteen-Eighty-Four-meets-hotel-commercial storyline. Kellyanne Conway’s phrase “alternative facts” set off alarm bells in January but actually falls short of Trump’s own brand of doublethink. According to Trump, there is no verifiable reality to which his discourse is alternative. “Any negative polls,” he tweeted last month, “are fake news.” Ipso facto, apparently. If the departure from Bush-Clinton-Obama gentility seems sudden, that is to some extent because Americans have spent the previous decades asleep, unable or unwilling to diagnose less well-advertised Orwellian developments. From his predecessors, Trump inherits a vast machinery of immigration laws, drones, and detention centers. He has only to use it. Looking back beyond 20th-century dystopian fiction can suggest other, more constructive forms of collective political imagination. In 14th-century England, Syria was celebrated as the homeland of the founders of Britain. According to a version of the wildly popular medieval historical narrative known as the Brut, Britain was discovered long before the birth of Christ by 33 Syrian sisters. Their father, the story goes, had married them off to 33 Syrian noblemen, whom they despised. The husbands beat their wives, but “they behaved even worse than before.” Their father, the king of Syria, was ashamed. He sent for his 33 daughters and told them to shape up or “lose his love forever.” The women responded by killing their husbands in the middle of the night, whereupon they were banished from Syria and set sail for Britain. The eldest sister, Albina, gave her name to the new country: Albion. The Albina legend is one of many origin stories that circulated in medieval England. In an earlier version, the women are said to come from Greece. Later on in the Brut, Britain is founded by the eponymous Brutus of Troy, great-grandson of Aeneas. That Albina and Brutus belong to legend rather than historical fact does nothing to mitigate their power as ideas. By tracing British polities back across the sea to Greek or Syrian nobility and Trojan conquerors, medieval English readers connected their island—situated at the edge of the known world—to cosmopolitan culture. For subjects with something to prove, immigration is not a problem but a necessity. The medieval English view of Syria was by no means egalitarian, however. After arriving on the island, Albina and her sisters become “wondrous eager” for men, lie with the Devil, and engender a race of giants whom Brutus must later eradicate. Temporal and physical distance from ancient Syria enabled readers of the Brut to project fantastical qualities onto the 33 immigrant sisters. The Albina legend participates in then-current discourses surrounding race, gender, and the East. At the same time, the story typifies the possibilities of literary imagination before modern nationalism. 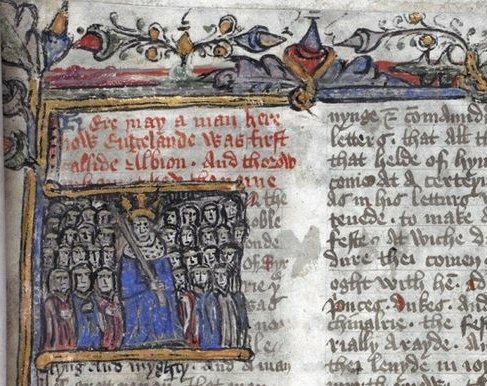 Scholars of medieval culture disagree about whether it makes sense to speak of ‘nations’ in the Middle Ages. If 14th-century England was a nation, it was a different kind from modern global powers like the United Kingdom and the United States. A monarchy administered by a hypermobile, multilingual elite, late medieval England was, in the words of Derek Pearsall, “part of the continent, and not a very important part” (Old English and Middle English Poetry, p. 85). The political imperative behind the Albina legend was the need to disavow Britain’s geographical and cultural marginality. When Chaucer entered the literary scene in the 1360s, he didn’t assume the cultural superiority of the English language. On the contrary, his provocation consisted in writing haute French and Italian literature, but writing it in English. Intervening between Chaucer and our current literary/political moment is the idea of the nation in the modern sense, an idea over which much ink has been spilled and for which countless people have died. Most political thought and action since the Enlightenment, from Mandela to Mussolini, has unfolded inside the idea of the nation. Trump’s ascendancy, like the result of the Brexit referendum in the UK, represents a rejection of late-century globalization and nostalgia for a nationalistic status quo. “Protect the Nation” is “Make America Great Again” and “America First” translated into an executive order. It is the arbitrary exercise of spiteful isolationism. Either version of the document could be fiction, if their effects on thousands of innocent lives were not so palpable. The protests at airports and across the country in January had a symbolic flavor, as protests tend to do. There were allusions to Lady Liberty, Voldemort, Mordor, and Orwell. The symbolism of literary fantasy, empty as it often must be, made a strangely appropriate response to such a destructive empty gesture. Expect more of the same this week. Trump’s campaign platform named real problems in America—income inequality, the entrenchment of a political class, the centralization of cultural power, terrorism—but proposed to solve them with the fantasy of a nation that becomes an island unto itself. Hence the resonance with the hypernationalized future landscapes of Nineteen Eighty-Four and The Handmaid’s Tale. Hence the Hulu series, whose viewers will presumably investigate their authoritarian reality by entering a yet more authoritarian fictional world. Medieval literature serves as a reminder that the political imaginary can exist beyond the traps and clichés of closed borders.